Every month we'll send you notification of our featured and new blog posts, upcoming webinars, training/events and new products. Every quarter we'll send you notification of training/events and new products, best practices, and blogs specific to our Solutions. Let’s break down the characteristics of a local motor disconnect under the UL 508 standard for devices and components, which is intended to be used for starting, stopping, regulating, controlling, or protecting electric motors and industrial equipment. Where this Code specifies that one equipment shall be ‘in sight from’ another equipment, the specified equipment is to be visible and not more than 15 m (50 ft) distant from the other. The majority of local motor disconnects are non-fused for the simple reason that fusing is typically already provided at the branch circuit and additional fusing is not necessary. However, in circumstances where that is not the case, for whatever reason or there are special circumstances, local motor disconnects have a fusible option as well. 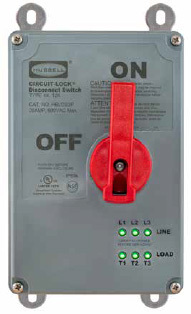 Beyond fusing, local disconnects typically have auxiliary contacts to wire back to a VFD (Variable Frequency Drive) or PLC (Programmable Logic Controller) and are HorsePower Rated based upon the possibility that the switch will be used to break the direct motor power under load. Would you like to learn more about IL508 and local motor disconnects? Contact your account manager or fill out our solutions information request form.